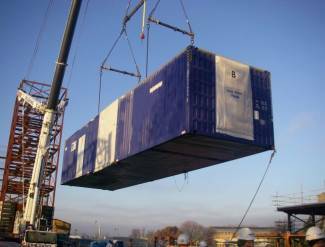 A new high-end student accommodation is nearing completion in Glasgow made from pre-manufactured steel boxes made and fitted out completely in China. Called “True Glasgow West End”, the 592-room complex taking shape on a former industrial site by the River Clyde borrows both its branding approach and luxury standards from the hotel business. At a time when the UK construction industry is under pressure to modernise with pre-manufacturing techniques, its developer says the modular approach isn’t cheaper, but does cut build time by up to 20%, improves health and safety, and ensures finished quality as predictably as car manufacturing. Everything in the room is sourced and fitted by China International Marine Containers (CIMC) except the TV and the bed mattress, which are added later. Successful topping out event for new 237-bed purpose-built student accommodation development, The Old Printworks, Edinburgh, on track and on budget for opening in August 2017. 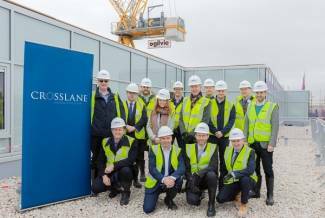 Crosslane Student Developments, part of the Crosslane Group, celebrated the topping out event of The Old Printworks development at 20 Bernard Terrace, Edinburgh, on 29 March 2017. The ceremony was conducted by Jon Stuart, Director of Crosslane Student Developments and Grier Edmead, Contracts Manager, Ogilvie Construction. The total development value of the property is approximately £31 million. Work on site commenced in January 2016 to develop a new, purpose-built, high specification, city centre scheme, comprising 44 studios and 193 cluster flat bedrooms ranging from three to nine bed clusters. In addition, there will be high quality communal facilities including a common room, meeting space, laundry facilities, gym and bike storage. The high specification scheme, due for completion in August 2017 in time for the 2017/2018 academic year, is in an ideal location amidst the popular student hub of Edinburgh, being just a short walk to the University of Edinburgh campus and close to the historic Royal Mile, in the heart of the city centre. BBC Scotland have recently featured a video of Ogilvie Construction's unique project at Kelvinhaugh Street in Glasgow. The video explains the new building method that saves around 20% of construction time using shipping containers that are fitted out off-site then stacked together to produce a nine storey student accommodation block. The full write-up and video can be seen here. 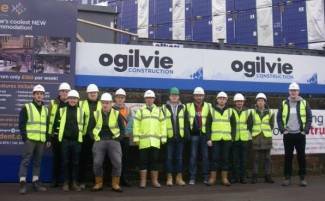 On the 15th February 2017, 2nd year HND Construction Manager Students from Glasgow College visited the Kelvinhaugh Student Accommodation project. Project Manager, Gavin Fraser and Trainee Graduate Site Manager, Stephen Prentice conducted the site walk-round and presentation to the students. Ann MacDonald, Lecturer from Glasgow College said: "The students were very impressed by their visit which has given them a very valuable insight into the many and varied responsibilities of a Construction Manager. Your presentation was superb and the site walk-round was very informative"
The Kelvinhaugh Street project was recently revealed as Ogilvie's 100th Considerate Construction Scheme project. 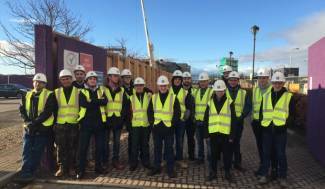 A group of students from the National Certificate in Civil Engineering Class at Dundee & Angus College recently visited the site of the New Premier Inn Hotel, Dundee Central. The students and course lecturer, Kevin Mill, were met on site by Ogilvie Construction Senior Site Manager, Stephen Mackie who gave an overview of the project. This was followed up by a guided tour of the site, by Scott Robertson, Site Manager and Billy Sutherland, Ground Works Supervisor. The students then had the chance to ask questions and project interfaces were looked at in detail. Lecturer Kevin Mill said of Ogilvie Construction "Because of your efforts and professionalism, our experience could not have been better. All or your employees were extremely courteous and went out of their way to explain various functions and answered any questions the students asked about the project. It's so important to us at the Dundee and Angus College from development aspects to encourage a learning approach which helps the students to make connections between the subject matter and the 'real world' of work or the profession, as this is invaluable to their studies and skills setting for future employees"
Ogilvie Construction has reached it’s 100th building project registered with the Considerate Constructors Scheme, reflecting the company’s commitment to operate safe, clean sites and respect neighbouring communities. 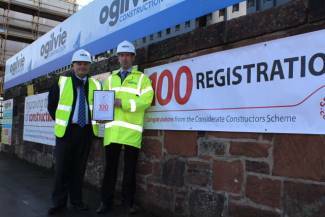 The site at Kelvinhaugh Street in Glasgow, where Ogilvie is building a 607 bedroom student accommodation building, has the honour of being the 100th project in the scheme. The Considerate Constructors Scheme is a non-profit making independent organisation founded in 1997 by the construction industry to improve its image. Construction sites, companies and suppliers voluntarily register with the Scheme and agree to abide by the Code of Considerate Practice, designed to encourage best practice beyond statutory requirements. The latest Glenigan tables of the top contractors in Scotland for 2016 has seen Ogilvie Construction finish the year strongly in 10th place. The 12 month period saw 14 deals won with a total value of £104 million. 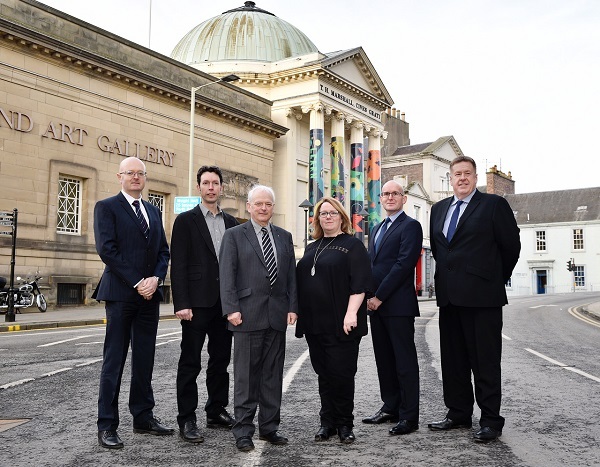 Perth and Kinross Council has announced today that £10M will be invested in Perth Museum and Art Gallery, which will result in a major overhaul to the building and see the creation of a new collection store in the city. The revamp will deliver modern facilities on par with the National Museum of Scotland and other recent major refurbishments. The local authority has appointed architectural firm Hoskins to lead the overall design of the project, with BAM Construction carrying out work on the museum and Ogilvie Construction tasked with building the new collection store on a separate site. Perth is currently bidding to become UK City of Culture 2021 and the museum renovation is intended to support the city of Perth’s future development. The project is anticipated to increase the cultural offerings of the city, improve the quality of life for residents and attract greater numbers of visitors. 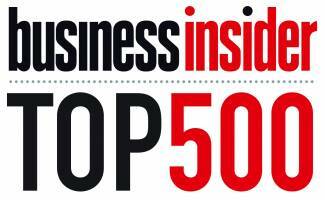 Ogilvie Group is delighted to have been announced as one of the Top 500 Scottish companies in Insider Magazine’s latest report. The rankings are based on a combination of profit and turnover, with Ogilvie jumping 25 places from the previous year to 107th on the list. Ogilvie reported turnover of £207million for the year ending June 2016, with a profit of £4.6million. The number of employees rose 1.6% in the same period to 461, with a profit per employee of £9,978. The list also contained a number of other Stirling-based businesses, a year on from the launch of the Stirling City Development Framework, a £200m plan to grow the city with major economic and cultural investments. Ogilvie Construction has been awarded the contract to build the new two-storey golf centre extension at Carnoustie Golf Links. The work is due to start in January for completion by December 2017, ahead of the Open Championship’s visit to Carnoustie in July 2018. The new building will provide a state-of-the-art golf practice and training facility along with a modern bar and restaurant with magnificent views over the golf course. 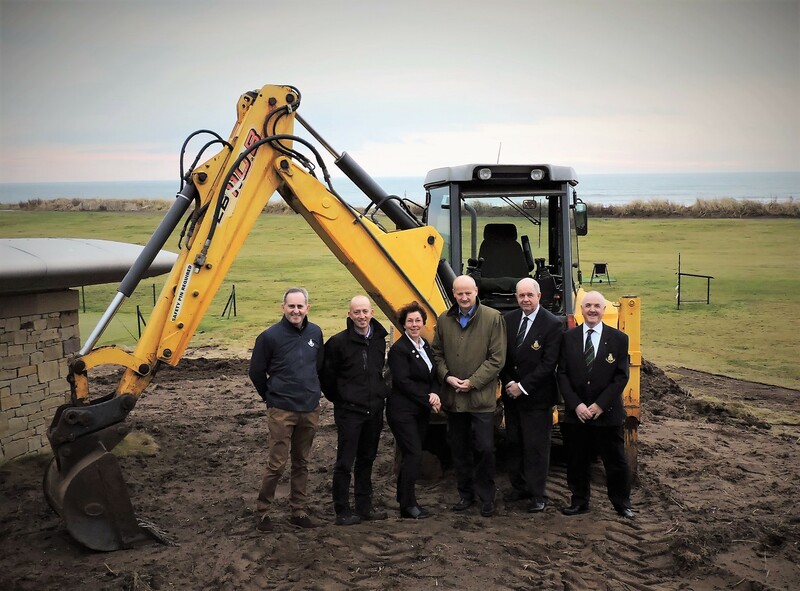 A spokesman for Carnoustie Golf Links Management Committee (CGLMC) said, "We now look forward to progressing this ambitious project in partnership with Ogilvie. The building will be open to all members of the public and the local townspeople will be strongly encouraged to make use of this community asset." Click here for more information and artist impressions of the project. 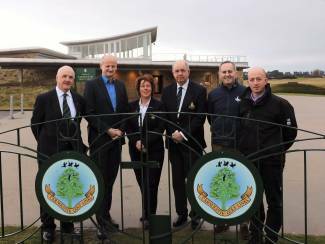 Ogilvie's Construction Director Bob Gray, with members of the Carnoustie Golf Links Management Committee. Artists impression of the new club house at Carnoustie, which will hold the Open Championship in 2018.